The experience with laparoscopic pancreatic surgery (LPS) in general, and pancreatic islet cell tumors (ICTs) in particular, is still limited. Because insulinoma is the most prevalent tumor and is mostly benign, single, and curable with surgical excision, it comprises most of the cases. 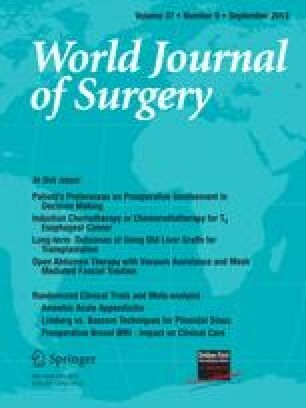 Our experience with 17 cases (10 insulinomas, 2 gastrinomas, 1 nesidioblastoma, 4 nonfunctioning tumors) and those recorded in the literature (93 cases) show that laparoscopic surgery for small, solitary benign islet cell tumors located in the body and tail is feasible and safe and can result in rapid postoperative recuperation and a complication rate comparable or lower than that achieved with open surgery. It duplicates the success rate seen with conventional surgery regarding intraoperative localization and cure of disease. The main morbidity continues to be the occurrence of a fistula (18%), most often after enucleation, but the clinical course is benign in most instances. Preoperative imaging studies are required for localization, and the combined use of biphasic helical computed tomography and endoscopic ultrasonography (US) seems to be cost-effective. The use of laparoscopic US is an integral part of the laparoscopic procedure, and the information achieved is valuable for both confirming localization and decision making concerning the most appropriate surgical procedure. In cases of distal pancreatectomy, splenic salvage, preferably with preservation of splenic vessels, is feasible albeit more demanding and can be achieved in most cases.